Job Interview Communication Skills - Interview Questions - How to stand out in an interview - Get the Job or Promotion Now! Avoid the anxiety of not knowing what to do. A "Success Program" that will help you ace the interview and get hired! View News interview with Mike Aguilera sharing some job interview tips. Below is also sample of track one...controlling the nerves. ​"You got some powerful information Mike! I'm done with the audio's and halfway through the Connect with Anyone in 90 Seconds or Less ebook. Once again thank you." Learn how to ace the job interview and stand out from everyone else so you get the job or promotion. Or, to do well in a performance review. I know many job hunters have a tight budget so this is my way of helping you now with a very cost effective result oriented program because I know when you are working again (or because you got the promotion) you will continue to purchase from me with confidence. One way to project confidence with body language is to make few moves. Composed people exhibit a level of stillness which is described as poise. Buy now to learn more body language tips and techniques. In the past, simply having a good resume and appropriate skills was enough, but not any more! The job hunting and interviewing process is getting very, very competitive. Eliminate fear and anxiety. It's a lot more than just explaining your capabilities and being friendly. You may have already experienced the frustrations of interviewing without being called back or hired. And once you get the interview, you need to know how to stand out of the applicant pool, and be the one they want. 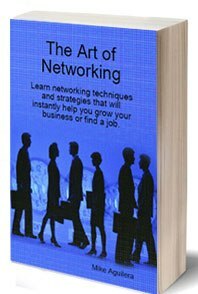 Why struggle?, discover new powerful communication techniques and dynamic strategies to get the job you want. Imagine having companies calling you and asking “when can you start?' or we need people like you.” Imagine you being in control to pick the next company of your choice and to influence the direction of your career. "Mike Aguilera engages the audience one hundred percent creating an inspirational and empowering atmosphere. Participants become fully engrossed in his presentation and leave with many valuable techniques that can immediately be put to use. Mike demonstrates easy-to-follow tips on how to network when looking for a job including how to create and maintain a resourceful mindset, how to focus on opportunities and how to be lucky. He captures class attention using illustrations of body language and specific words that can hamper one's success during an interview. Mike says, “Ask What else can I do?' instead of asking Why?' “ He explains simple methods that can often make the difference between getting the job or being passed over, such as handing your resume to the interviewer with care and speaking with slow, confident movements. Not only does Mike detail traditional networking techniques he also explains how to effectively use technology and web sites like Google, Linkedin, Facebook and Meetingup. His research tactics include identifying companies, associations and individuals who can lead to a job and what to do once you've found them. Mike is a talented, practical and unpretentious speaker and coach who knows how to persuade, motivate and inspire!" “I had the pleasure of attending Mike Aguilera’s presentation at a seminar on Interview Techniques. Mike covered a broader scope than interviewing, including how to find a job and the mindset to see opportunities. I have been impressed by Mike’s clear explanations, knowledge of the matter and energy he projects. I liked his focus on techniques, tactics and strategies to successfully face an interview. Mike is also very entertaining, while providing useful information and references that allowed me to further explore the various subjects he covered. I have been pleased to meet him and I would definitely recommend him." "The information helped in many ways...how to make the interviewer see me as the right person to hired." "Gave me great communication ideas for an interview." "I was impressed with the body movement techniques." "I wish I would have know this before my last interview. This information is vital!" Five instant download digital products. Nine information packed audio tracks. A total of 43 minutes of valuable tips and techniques that will instantly help you. The communication skills you learn also apply to internal company interviews for advancements or job department changes. The audios are a few years old however still very relevant and effective techniques to ace the interview. They will soon be discounted or updated. Available now at a major discount for a limited time. This audio session is on how to communicate persuasively with your mind, body, and voice...at a subconscious level. How to exude confidence and stand out as the person to hire. How to control your thoughts and emotions. How to confidently communicate with your voice and body motion. Voice patterns of influence. Which to use and which to avoid. Discover how to communicate using powerful and persuasive words. “Dangerous” words to avoid. Using any of these words incorrectly can destroy your interview. Discover how to handle difficult questions. The two most powerful questions to ask. It's critical that you understand and ask these questions, in order to stay in control of the interview. You will learn about these and much more! ​30 day money back guarantee on digital products. Yes you have a full 30 days to use and test over and over. Email me within 30 days if you want to get a full refund. You win either way. It's either you seize all the glorious powers of becoming a great communicator, or we'll give you all your money back. We won't even ask you the reason why and we'll stay as friends, ok? Looking back at the decision you're about to make today, what will be different a few weeks from now? How will you feel as a result of your decision now? If you don't grab this special opportunity, how will you know the type of successful life that could be awaiting you after using these life-changing Job interview communication techniques? How will you know the obstacles that might be keeping you from getting anything you have ever dreamed of? How will you benefit from the personal experiences, testing, and hardships of an established expert communicator... one who has already gone through all the troubles and difficulties so you don't have to? Just imagine... the frustrations of having no control over an interview and situations... the rejections... the feeling of getting broke... being a slave to other people's desires... not being able to get what you really want in life. Fortunately, you have the opportunity to end all your pains and agonies forever, starting today. Now you easily create rapport with people, so you're in control of your life. Suddenly, what used to be a big problem is now something that no longer bothers you. Feel the recognition... the praise... the money... the power... the success. You deserve to live the good life. Make it happen! You already know the right thing to do. Buy Now!